I am having a bit of a Buffalo Hot Sauce moment. I want to put it on everything. Not my breakfast. But everything else. I was able to incorporate my Buffalo Sauce (which is called Just Wing It!) into my lunch and dinner yesterday! Actually, I put the buffalo flavor into three things! I wasn’t hungry at all until around 2pm! I was shocked, but then again I didn’t eat my breakfast until around 9:30, which is so odd for me. Then again, I did get a late start on my run yesterday. 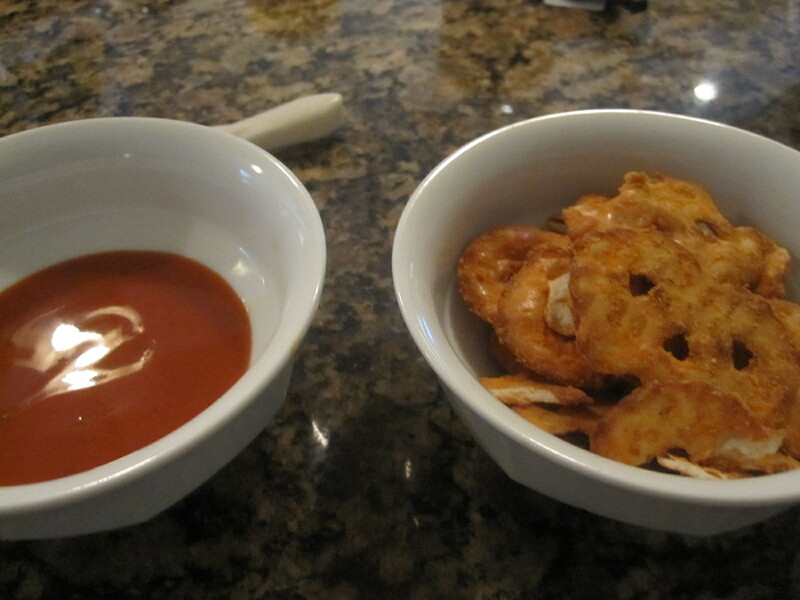 Buffalo flavored Pretzel Chips. Dipped in Just Wing It! Buffalo Sauce. Overkill? No way. Absolutely delicious. To cool my tongue after that? An amazing fruit salad using up all the fruit in my fridge that needed to be eaten immediately. 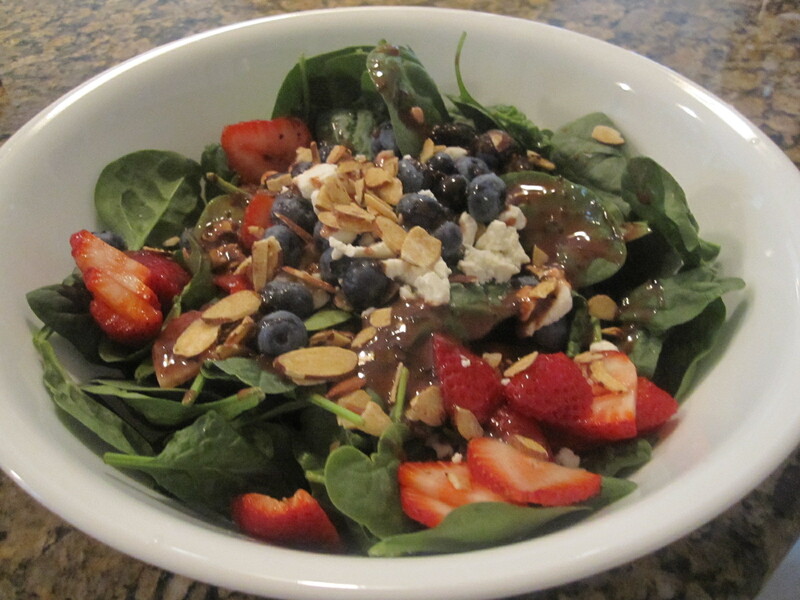 Baby spinach, blueberries, strawberries, 1 tbsp crumbled goat cheese, 2 tbsps Cinnamon Almond Accents Slivered Almonds, 2 tbsps Stonewall Kitchen Strawberry Balsamic Vinaigrette, and regular balsamic vinegar. Creamy, light, and delicious. I may have to repeat this on Monday with the tons of plums I found at the market. Or apricots?! Speaking of plums, I ate a pretty big one as an after-lunch snack. 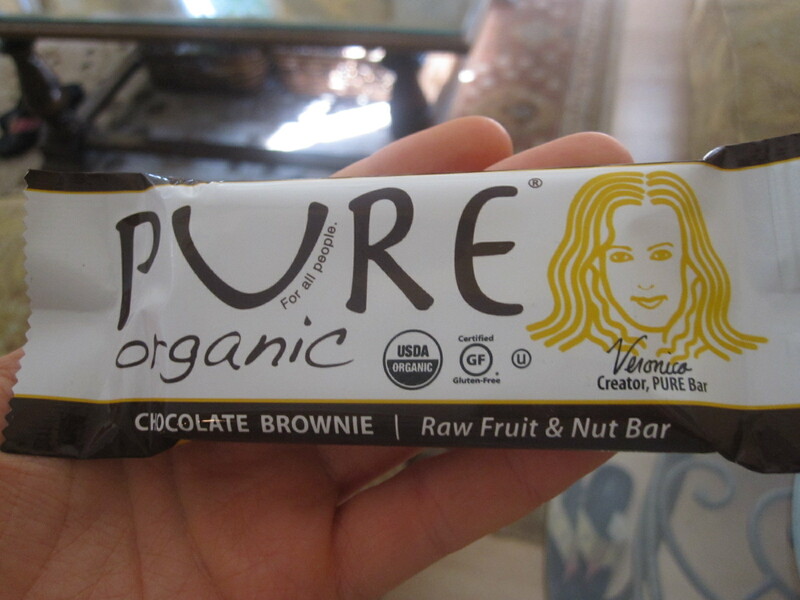 For my pre-show nosh, I chose my Pure Chocolate Brownie Bar. Verdict? Delicious! Tastes exactly like a Chocolate Jocalat, but much less intense (it doesn’t have raw cocoa mass like the Jocalat). Actually, these all taste pretty much the same as Larabars only with a couple less calories (this has 180, the Chocolate Jocalat can go from 190 to 220 depending on the flavor). I need to get more of the Chocolate Coffee ones!!! For dinner I ended up packing some roasted broccoli with pepper flakes my mom had sprinkled on top (gave it a great hot kick! ), three giant sliced carrots, and a Flatout wrap with 1 chicken breast, diced. I topped it with a handful of spinach, Mozzarella Veggie Rice Shreds and of course more hot sauce and nuked it in the microwave for about 2 minutes until everything melted. It was gooey and amazing even three hours later! I also packed a gigantic orange that I snacked on during Act 2. Also yesterday, I realized that I have not binged in over three months. I’m so happy!! 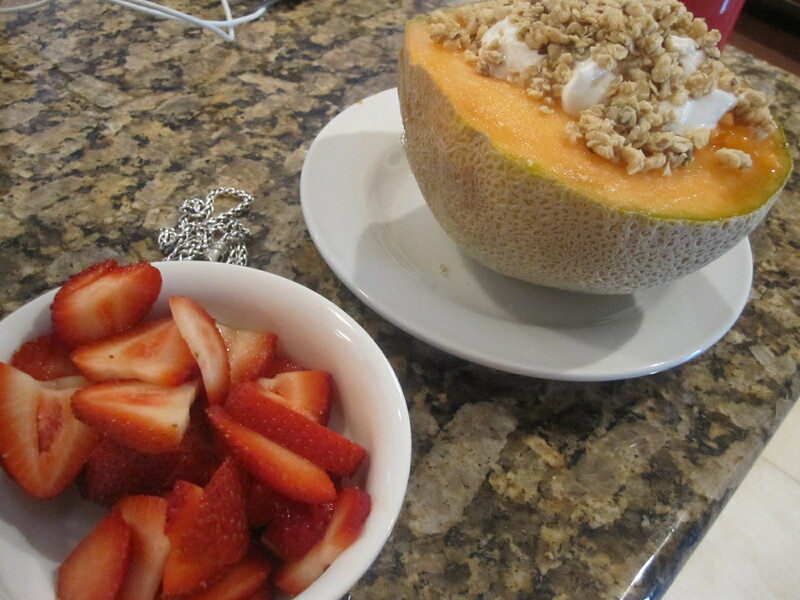 Today I woke up and knew I’d have to use the canteloupe that’s been lingering on my countertop for the past few days. It’s getting a little soft, so it’s just about ripe for eating. I sliced it in half and went to work! I didn’t even realize my mom’s necklace was sitting there! Then a few moments ago I enjoyed a midmorning snack of cherries. Can’t wait to enjoy my day off from working out with some sun and relaxation! I may have a barbecued tempeh pita for dinner tonight? Perhaps melted with some gooey vegan cheese? Ohhhhh, my mouth is watering already! Is it lunchtime yet? !